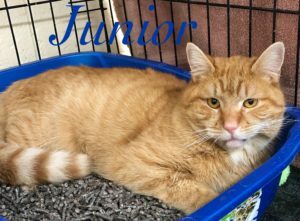 Junior is a gorgeous orange tabby male, born around 1/10/15. We don’t know his back story, but Junior ended up in the Town of Hempstead Animal Shelter, where it was discovered that he had a broken jaw! The Shelter veterinarian wired Junior’s jaw so it can heal. Junior has made his way to Last Hope where he is resting, eating soft food, and being doted on by the volunteers. Despite his past, Junior is a friendly, sweet boy. Come meet Junior! You will love him!